We recently had a request for this recipe. It was a first-time experiment, but it came out nicely. The only issue we had with it was that the chickpeas in the couscous were overcooked. We have adjusted the cooking time in the recipe below to compensate. We haven't yet gotten around to trying it again, though, so let us know how it turns out if you make it. 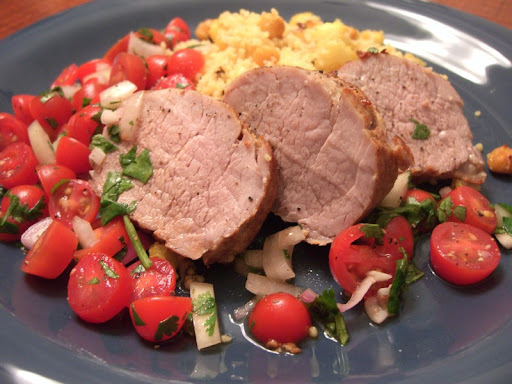 One tenderloin prepared as directed will yield 3 servings, while the couscous and salad will serve 4 to 5. It is easy to make two tenderloins, just double the rub amounts and continue as directed. Preheat the oven to 400' F. Sprinkle the salt onto the garlic clove and mince together until the garlic and salt forms a paste. Mix in the 1/4-teaspoon cumin and 1/8-teaspoon ceyanne. Trim the tenderloin removing most of the tough silverskin. Cut a couple of inches off the thin, pointy end so that you have a more uniform shape - it will cook more evenly. Save the small piece for another use. Rub the garlic mixture all over the pork and leave at room temperature about 30 minutes. Prepare the Salad: cut each grape tomato crosswise into 2 or 3 pieces. Thinly slice and then chop the onion into 1/2-inch lengths. Mix together the tomato, onion, cilantro, vinegar and salt (about 1/4 teaspoon). Taste for seasoning and adjust with additional vinegar or salt as needed. Keep at room temperature until ready to serve. Prepare the Couscous: Mix together the 1/2 teaspoon cumin, 1/4 teaspoon tumeric and 1/4 teaspoon kosher salt. Put the cauliflower florets on a baking sheet and sprinkle with the spice mixture. Drizzle with 2 tablespoons olive oil and toss gently. Place into the hot oven. After 15 minutes, add the shallot slices and chickpeas to the pan and roast an additional for 10 minutes or until the cauliflower is tender. Right after placing the chickpeas in the oven, heat the chicken broth on high in a small saucepan. As soon as it reaches a boil, stir in 1/4 teaspoon kosher salt and the couscous. Immediately remove from the heat and cover with a lid. Let stand 5 to 10 minutes, then fluff with a fork and stir in the roasted cauliflower and chickpeas. Drizzle the teaspoon of vinegar over the couscous and toss. Keep warm until ready to serve. Finish the Pork Tenderloin: Heat an oven-proof frying pan over medium-high heat. When hot, add a tablespoon of olive oil. Sear the pork tenderloin, 2-3 minutes per side or until nicely browned. Put the pan into the 400' oven for 15-17 minutes (you can do this while the cauliflower is still cooking) . When done, remove from oven and let rest for 5 to 10 minutes before slicing into 1/2-thick medalions. Serve the salad, couscous and sliced pork together on warmed dinner plates. Sounds very yummy...and easy (my main criteria)! One question: At the end it says to put the tenderloin in the 400 degree oven "with the cauliflower." But the cauliflower is already in with the couscous mixture keeping warm. So....? Hi weezee, I actually cook the pork at the same time as the cauliflower couscous, but it was tricky to explain in the recipe. If you start to brown the pork just after putting the cauliflower in the oven, both should be done roasting at about the same time and you can finish the couscous while the meat is resting. (But it's preferable to error on the side of finishing the couscous early since it'll hold better.) Good luck and thanks for the comment!